Man soll etwas so einfach wie möglich machen - aber nicht einfacher. Das ist weniger als der Wirkungsgrad eines normalen Automotors. Projekte mit einem derart schlechten Wirkungsgrad sollte man heute (im Jahr 2005) besser unterlassen. Oder denn aber die Fokussierung auf eine ganzheitliche Wertschöpfung richten. 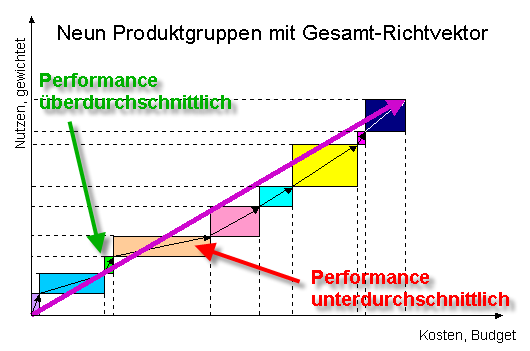 Der Value-Grid visualisiert, dass bei der Kostenfokussierung die drei anderen Optionen zum Wertemanagement "ausser Betracht fallen". invisible value - the case for measuring and reporting intellectual capital. The identification, measurement and reporting of intellectual capital emerged as an important issue at the (Australian) National Innovation Summit in February 2000. The Government’s major package on innovation, Backing Australia’s Ability, announced in early 2001, is based on the recognition that intangible assets are outstripping traditional assets as drivers of growth. This paper reviews several internal and external measures of intellectual capital and the accounting treatment of intangible assets. International experiences and developments in this area are also considered. This version of the paper includes technical detail and bibliography; a shorter less technical version is also available. Most other work in this field refers to the so-called Knowledge-based Economy (sometimes called the New Economy or Modern Economy). The framework presented in this paper explicitly includes the concept of a knowledge-based society because of the presumed importance of social factors to economic change and the potential impacts on society of an increasing emphasis on the importance of knowledge. It is, however, acknowledged that the treatment of knowledge in society in this framework is most strongly focussed on aspects which are related to the economy, either as inputs or outcomes. The aim of this Discussion Paper is to stimulate discussion on the proposed framework. Readers are therefore invited to comment on the theoretical basis and structure of the framework, as well as the range of indicators proposed. What is The U.S. Gross Investment in Intangibles? (at least) One Trillion Dollars A Year! This paper argues that the rate of intangible investment – investment in the development and marketing of new products – accelerated in the wake of the electronics revolution in the 1970s. The paper presents preliminary direct and indirect empirical evidence that US private firms currently invest at least $1 trillion annually in intangibles. This rate of investment roughly equals US gross investment in nonresidential tangible assets. It also suggests that the capital stock of intangibles in the US has an equilibrium market value of at least $5 trillion. Die Art der Arbeit hat sich zwar vom "Handwerk" zum "Kopfwerk" verlagert. Und damit haben sich die primären Ergebnisse der Arbeit vom materiellen / tangiblen / "objektiv" messbaren Produkt zu einem immateriellen / intangiblen / "subjektiv" messbaren Produkt geändert. Die klassischen und etablierten Führungskenngrössen basieren hingegen mehrheitlich noch auf den "objektiven" monetären Indikatoren. Das hat zur Folge, dass in Entscheiden, die auf der Grundlage der klassischen Indikatoren geschehen, drei von vier Wertearten aus systemischen Gründen gar nicht berücksichtigt werden. ..sind die Lösung, wenn qualitative und quantitative Werteigenschaften gemeinsam berücksichtigt werden müssen. ..sind die Lösung, wenn heutige und zukünftige Werteigenschaften gemeinsam berücksichtigt werden müssen. ..sind die Lösung, wenn Kosten und Nutzen gemeinsam betrachtet werden sollen. ..sind die Lösung, wenn eine lineare Wertemetrik nicht mehr genügt. ..sind die Lösung, wenn Zusammenhänge zählen sollen. Mit den Augen zu sehen, was vor den Augen Dir liegt. In die Augen in den Sinn. Kosten und Nutzen auf einen Blick! 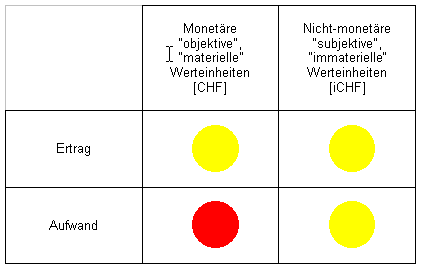 Bestechend logisch und wesentlich transparenter.